Our essences feel very special. Of course we’d say that! But really, they do. It has been an absolute joy to create these 100 plus essences, with more to come in the future. You’ll notice I change from ‘our’ to ‘my’ sometimes...I must say right here that ‘me, myself, I’ (see About Shelley under About Us) could not do what I do without the support of ‘our, we, us’, and that is my beloved husband Ian, our border collie helpers, and Mother Nature herself. ‘We’ are a team here. I co-create the essences with Nature, along with one or all of the dogs present, I do the bottling, translating and writing, and Ian then takes over to interpret the energies for label and website design and all manner of other creative expressions. You get the full team spirit with each essence you look at and buy. When SheWolf was created as my first essence in 2003, I had no idea that she would lead me on to so many vibrant creations. All of our 100 plus essences have been created in our garden, except for Spa Transformations Bliss essence which was created on Pett Level Beach where there is a 3,000 year old fossilised forest only visible at low tide, and Star Seed Potential Oak/Yew essence, created in an ancient forest under a 300 year old Oak and a Yew tree of similar age. The journey of making all these essences within 2 acres of garden has really focused my attention on listening to the land here, watching it closely through the seasons, and observing the flowers, trees and all of nature right up close – really close. 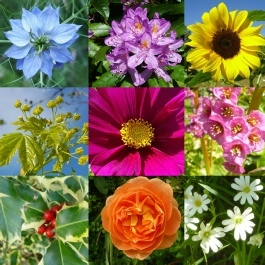 The flowers have bloomed here year after year, becoming more abundant, vibrant and glorious with each season. Having very active border collies (see About our Border Collies) means that being outside most of the day, every day, is a very natural part of our life. Their energy and wisdom has taught us as much as the flowers and energy of the garden has. Each stock and spray essence is bottled by hand from lovingly created Mother Tinctures, and labelled by hand too. The bottling and labelling of each essence feels like a ceremony in itself, and is always done in complete peace and quiet, being immersed in the energy of the essence being bottled. Ian designs the labels to reflect the character and resonance of each essence. When you look at the label you are looking at the life force of the essence itself. 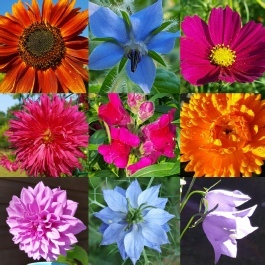 This is also why we have designed the website to be picture lead, so that you are guided to choose your essences from the pictures of the actual flowers from which the essence was made, or from a label design which really reflects the resonance of the essence calling to you through its visual aura. As we say under About Us, the land here is full of light and inspiration. We hope you enjoy our essences as much as we enjoy everything we do in bringing them to you.